if you follow my twitter feed or my check-ins on foursquare, you know i am one for a burger or pizza. easily my top two favorite foods. at lunch today, while sitting at five guys, i was thinking about the best burger in HoCo. we all know that five guys and wendy’s are my favorites for fast food. my love of burgers probably started when i got my head stuck between the rails in the line at the wendy’s on dobbin as a young kid and has continued since then. five guys makes a great burger and has a nice selection of toppings. i usually go with the little cheeseburger. sometimes with bacon, sometimes without. depends on the mood. of course, everyone knows about the bag full of french fries that you get as well. wendy’s on the other hand has recently changed their burgers to be “hot ‘n juicy” (which they are if you haven’t been lately). i probably end up at wendy’s twice a week. sometimes for a regular meal and sometimes on the weekend for a jr. cheeseburger to go for lunch. anyway, enough about regular fast food joints. who do you think has the best burger in HoCo? many people would say Victoria’s Gastro Pub, which unfortunately I haven’t been to yet. we’ve tried to go recently but the line was out the door, which isn’t convenient during winter! 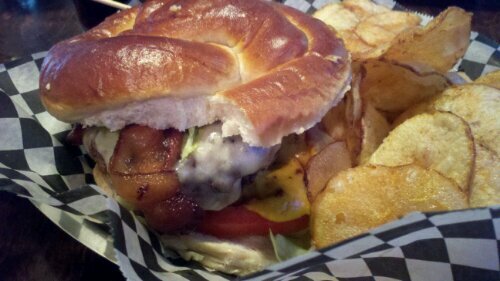 one of my favorite new burger places is the BGR joint. although it is not a family owned business, they do a make a great burger and have some interesting selections. they are a little pricey though compared to somewhere else you might go. try the sweet potato fries if you go! bee’s first addition to the blog: not a huge burger fan, but with a “guy” who loves them, i have tried to get in the spirit of enjoying them. my favorite “burger” comes in the form of the sliders at BGR. perfect for a not burger lover and a lover of miniature foods. so, what do you think the best burger in HoCo is? addendum (also from bee): the BEST side to any burger, in my humble opinion, is the milkshake. cheeburger cheeburger (which also has great burgers) has the best milkshakes, hands down, in HoCo. and, if you ask really nicely, they will also do custom orders on their milkshakes. very nice people they are. Second Chance Saloon — the bleu cheese dealio is the best! Thanks for commenting! I’ll add it to the list. Finally branching out to some of the hidden gems around town. The wagyu beef burger at Iron Bridge is one of my favorites. Never been there. Guess we’ll have to try it out!